This Agreement was last modified on December 1, 2018. 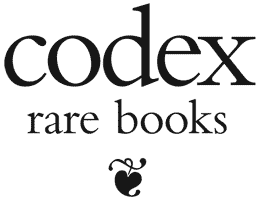 The Site and all of its original content are the sole property of Codex Rare Books and codexrarebooks.com and are, as such, fully protected by the appropriate international copyright and other intellectual property rights laws. Codex Rare Books and codexrarebooks.com reserves the right to terminate your access to the Site, without any advance notice. We therefore ask that you check and review this Agreement for such changes on an occasional basis. Should you not agree to any provision of this Agreement or any changes we make to this Agreement, we ask and advise that you do not use or continue to access the Codex Rare Books and codexrarebooks.com site immediately. The privacy of visitors to codexrarebooks.com is important to us. At codexrarebooks.com, we recognize that the privacy of your personal information is important. Here is information on the types of personal information we receive and collect when you visit codexrarebooks.com, and how we safeguard your information. We never sell, exchange, transfer, or give your personal information to third parties for any reason. We collect information from you when you subscribe to our services or fill out a form on codexrarebooks.com. We implement a variety of security measures to maintain the safety of your personal information when you enter, submit, or access it. Though you enter your credit card number on our website, we do not store that data on our server. This information is stored with PayPal and their systems protect your information securely. The email address you provide for order-processing may be used to send you information and updates pertaining to your service and orders. Note: If at any time you would like to unsubscribe from future emails, email us at: unsubscribe@codexrarebooks.com with the subject "unsubscribe", or follow the link in the message. We do not use third-party advertising. Consequently we do not use third-party cookies. You can chose to disable or selectively turn off our cookies in your browser settings, or by managing preferences in programs such as Norton Internet Security. However, this can affect how you are able to interact with our site as well as other websites. This could include the inability to login to services or programs, such as logging into your account. By default, all codexrarebooks.com cookies automatically expire after 90 days.